Diana Hanks is no fair-weather cyclist. In fact, the Winooski resident, an operating-room assistant at Fletcher Allen Health Care, actually prefers bike commuting in winter. Never mind the cold season’s potential dangers and discomforts. But why would anyone go to such extremes? What’s the point of biking into Arctic headwinds and through rain, sleet, snow and gloom of night? None of the 10 cold-weather bikers interviewed for this article reports having broken any bones or required any stitches as a result of two-wheeling it in winter. But admittedly, that’s partly due to good luck. Careful riding and quick reactions are certainly called for. “Hit some black ice and — boom! — you’re down. You won’t even know why,” says Eames, a veteran winter rider. It’s happened to him, but he got back on his bike and rode off every time, he recounts. Beganyi recalls the potential disaster a few years ago when his bike suddenly spun out and he went tumbling into a lane of traffic on North Avenue near Burlington High School. “Luckily, no one was behind me,” he says. 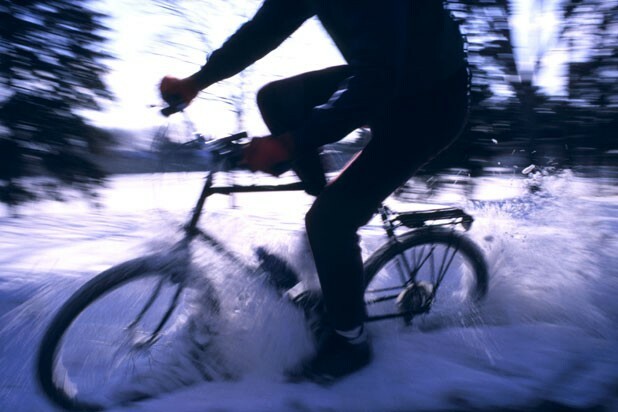 That brush with injury, or death, didn’t deter him from winter cycling, though he did switch from a bike with skinny, studded tires to a Pugsley — a brute of a machine with wheels as thick as a fist. Beganyi, who works at home, pedals the Pugsley on midwinter joyrides through the Intervale and onto the frozen lake near the Boathouse, when skaters are out there, as well. He also goes for 100-mile rides along roads and snowmobile trails. Winter’s road hazards prevent Roger Bombardier from riding his bike from late December to March. The snow that buries the already-skinny shoulder along Route 2 makes his nine-mile commute between Richmond and Burlington too dangerous, says Bombardier, 44, who’s studying history at UVM. “When the fear level gets to the point where all my enjoyment is sapped, I drive,” he says. But it’s not about fashion, Local Motion’s Wallace adds. Acknowledging that many more men than women ride in winter, she suggests that may be due in part to females’ greater unwillingness to arrive at work sweaty and snowed upon. “My own style is pretty casual,” Wallace says, “and I don’t mind if I get sweaty.” Aultman-Hall has generally the same attitude, though she admits that cycling can lead to some bad hair days. “Helmet head is definitely an issue,” she confesses. The quality of the bicycle matters a lot, adds Scott Luria, who commutes on his “very fancy” custom-made, titanium bike all but “maybe five days a winter.” It’s got disc brakes and a frame that allows Luria to switch wheel sizes, from skinny when the road and bike paths are snow-free, to studded mountain bike tires when they’re not. Lisa Aultman-Hall wears a hat with earflaps under her helmet. In deep cold, she pulls on a balaclava — the covering with eye and nostril holes that’s also the favorite facial wear of bank robbers and terrorists. Glenn Eames suggests getting a pair of safety goggles. Without them, “it can be like biking inside a snow globe,” he says. Roger Bombardier wants to be sure drivers see him just as well as he sees them. “Wear neon,” he advises. Lobster mittens will keep a biker’s hands warm almost regardless of how low the mercury goes, Eames says. Luria, however, sticks hand-warmer packets in his gloves “when it’s super cold.” He also wears booties on those days. Woolen socks inside knobby-grip boots (without toe clips) keep Jon Adams-Kollitz’s feet warm. “Biking-specific winter boots” that can be found at many cycle shops are worth the investment, Mike Beganyi says. Some snow-season riders pedal beaters; others spend $1600 on a Pugsley or even more on a bespoke bike; most rely on mid-market mountain bikes in good condition. And all use studded tires — except Diana Hanks who likes the knobby kind that help cyclocross racers slosh through mud, glide on sand and bump over rocks. Get a mountain bike made in the mid-1990s with a rigid fork, Eames advises. Models made after that often have suspension, “which won’t do anything for you,” he says. The chain and derailleur have to be cleaned and lubed regularly, preferably with a viscous oil that will cling to the parts, Eames says.